Purée and strain the pears with a sieve to get out the lumps. Repeat until you have 2 quarts of purée. Add spices and enough sugar to make it sweet (start with 2 cups of sugar and slowly increase). Pour into a 9″ X 13″ baking pan and cook in oven at 325° checking and stirring every 10 minutes until it is as thick as you want it. Pour into pint jars leaving 1/4 inch head space and waterbath for 10 minutes once water starts boiling. Makes about 2-1/2 pints. 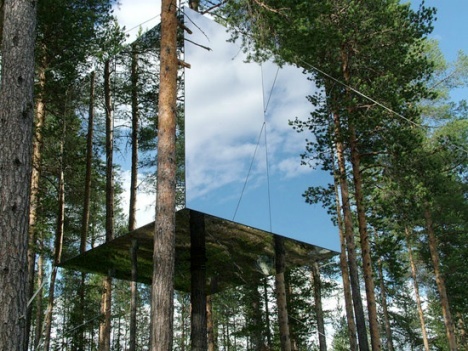 Almost invisible mirrored tree house built in Sweden. Click HERE to see more pictures and read about it. Isaiah was eating a peach and found the pit. He exclaimed “a bone!”. ← Flowers, Bees, And Moths! Yes, I did enjoy! The pear butter looked SO yummy,and the mirror treehouse was really interesting! OK, those videos were Howl-arious!! 😆 Cats certainly have a personality quite like Simon’s Cat! Hi, girls! It’s been a while since I’ve been able to find time to visit all my favorite blogs, so I’m really happy that my schedule is clearing up and I can visit you all again! 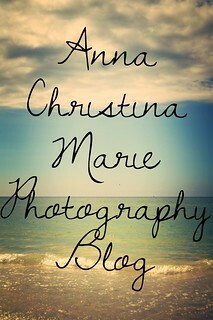 What a LOVELY JOB you’ve done with your blog! 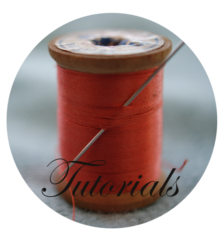 I would very much like to put a button link to you on my blog; and also your “FarmGirlTreasures” button that links to your etsy shop…is it ok if I make a copy of it? When I first visited you, maybe a year ago or a little more now, I told you that I live in suburban Chicago…very far from anything farm-like! But my heart is that of a country-girl, and my oldest son (18.5) is on his way to becoming a sheep farmer…he just started his college classes this week, wants to get an associates degree in agriculture production and farm management and then will look for an apprenticeship on an organic, pasture based sheep farm (to learn what he REALLY needs to know, LOL!). All that to say that we have a love of farm-life in our family, though we don’t get to live it! I started a meme called “Friday FarmGirls at Heart” which has been fun. Anyway, I’d love to share your blog and your lives in that meme next week, so the buttons will be delightful! May you have a blessed week, I know it is a very busy time right now! 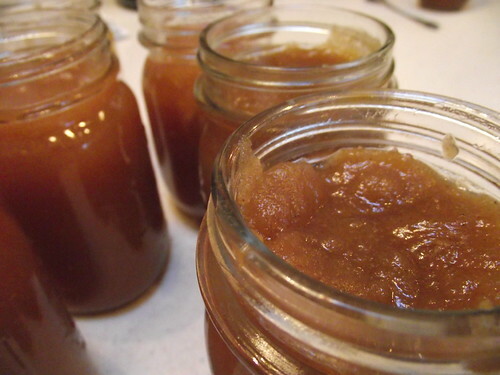 It looks like you’re going to have plenty of green beans and pear butter–Yum! The mirrored treehouse is neat but I really like the old-fashioned kind better. This was a great post – thank you for sharing. Thanks so much for the pear butter recipe! We have loads of pears getting ripe right now and need lots of ways of fixing them. One question, though — how are you making the “pear puree” to start out with? Cooking them down? Using a food processor? or just what? 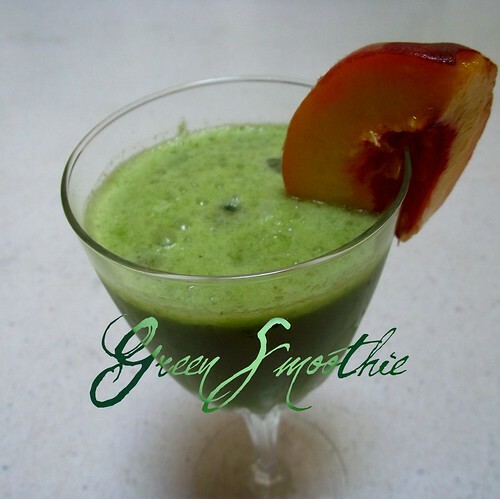 Thanks for sharing~I always enjoy reading your lovely posts, Seven Sisters! And the recipes for jam, etc. over at FF look simply delicious! I always wondered if you have a system to know how much to can. Do you just can as much as possible or have the meals planned out that far in advance? I’d love to start but I have absolutely no clue. Is there any books you could recommend or any tips you may have? Thank you so much! We kind of go by how much we ate the year before, but that doesn’t help when you’re getting started, does it?! 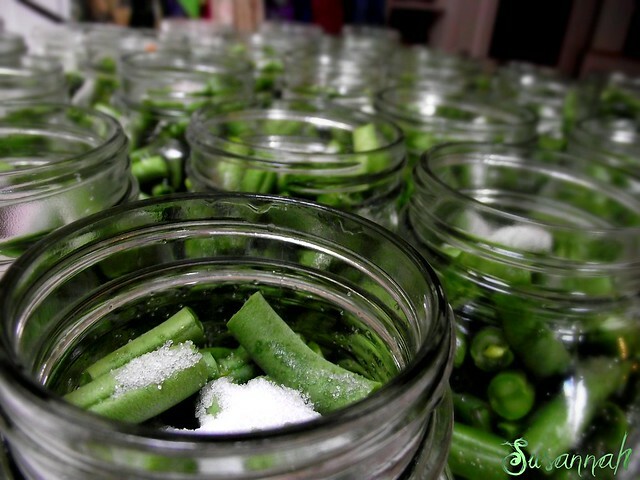 😀 We don’t really plan the meals out, but we do know that we eat a lot of green beans, so we can as much as possible (as much as the garden will give us) but we know that we only went through 14 pints of pear butter last year, so we don’t need to do as much of that. 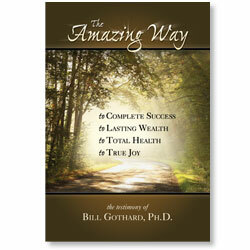 I guess the best thing is to start somewhere, and each year you’ll learn how much you need of what. We’ve made up a chart that we redo each year listing the names of the foods we canned, the amount we had left over from the previous year, the count of what we made the current year, and the total together–that way we have a record of what all we did. As far as canning books go, we use the Ball Blue Book a lot, and Mommy likes the “Farm Journal’s Freezing and Canning Cookbook” edited by Nell Nichols and Kathryn Larson. It was good seeing you all on saterday! Once again, wonderful post! I always enjoy having a glimpse of your busy lives! The green beans look yummy; that should last you all winter! Wish I knew I could can, and hope to learn in the near future. I see you are a Simon the cat fan as well! Great videos to watch when you’re feeling low, or just to have a good laugh! 🙂 I think they came out with a new one about the cat playing in a box! 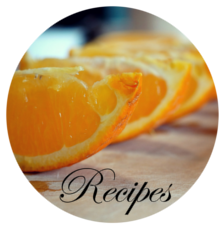 The recipe looks yummy, thanks for sharing! That is the weirdest house I have ever seen!!! How clever of them to think of that. It really does look almost invisible, and at first I had a hard time believing it was real. Hope you are all having a lovely day! Thank you again for the encouraging posts! Oh do they have a new one?! We should go searching for it because we really like Simon’s Cat 😀 Thanks so much for your lovely long comment! Can you ask to be my friend? Susannah, I would like to know how you’re doing with the hats for the knit and crochet-along for Romania. Of course, we still have some time (the shipping deadline is Oct. 10th) but I’d like to know how much progress we’ve made towards our goal of 100 hats. 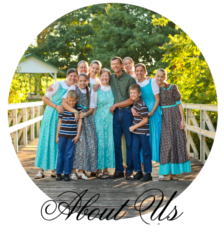 Please visit my blog and leave a comment on my post “Progress?”! If you haven’t made much of any progress, that’s fine too. But please let me know anyway. Thanks in advance! 🙂 Blessings! Wow, that is a cool tree house! Hey, being inside it would be the next best thing to being invisible, right?